I know I am doing this a day late… but, I have a very good reason. This weekend we had a garage sale. I had to get rid of a lot of stuff. But it was worth it. I had scrounged up all the money I made in the garage sale. I did well. I sold books, webkinz, clothes. 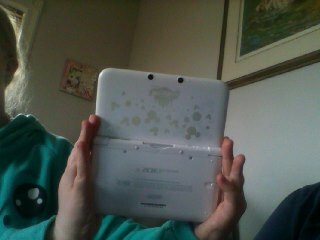 With the help of my mom, I bought a Nintendo 3DS XL and the game Animal Crossing. Trust me when I say this, it was worth every coin and bill. This is why I am saying this. Unlike any other Ds generation, Nintendo has created the most amazing handheld gaming system yet. From 3D graphics to Internet, Nintendo 3DS is pretty much like a mini WII. When I first got it, I was just amazed. When I saw the features on the box, I was in awe. I mean, who wouldn’t?! It has a 3DS Camera, MII maker, Internet Browser, AR Games, which is pretty cool, Face Raiders, also pretty cool and so much more!! My favourite feature is the MII maker. Just like it describes, like on WII, you can make the caricatures that are called MII’S, but on 3DS. I have already made 11 MIIs and that is in technically, 1 full day. There’s another thing, Animal Crossing. Animal Crossing is a game I bought along with the 3DS XL. Animal Crossing is a game where you are on a train and, you are approached by a cat called Rover. He asks if he could sit across from you. You can say Yes, or you can say no. I always say yes as I made two files. The first file I named my character Jess as that’s my name. I named the town where I’m going on the game Jesstown. As soon as I arrive in Jesstown, a group of animals surround me, one thing after they think I’m the new mayor. I try to say I’m not, but the sheep named Isabelle who’s my secretary says I have a great sense of humour. To buy a house, you have to pay 10,00o bells. To get that you have to pick up resources then go to sell them at the Re-Tail shop. When you get the money, Tom Nook the owner and builder says he will start tomorrow and then asks what colour roof you want. Nintendo 3ds is an awesome handheld game system. Disclaimer: All of this is my opinion, other people may think otherwise.